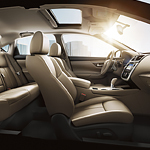 As one of the most popular midsize sedans on the road, the Nissan Altima has an avid following of admirers. The base model proved a favorite of drivers for decades, but for those who want to personalize their Altima, there are plenty of aftermarket modifications. Coordinate with your vehicle's interior by adding complimentary seat covers, floor mats and steering wheel wraps. You can also protect your interior by adding aftermarket cargo liners or pet beds. Organize your trunk by adding a compartmentalized crate designed to fit the space. Fun additions like dashboard kits or knob shifters can further customize your interior and make it unique. If you'd like to shop for accessories or have some added to your Altima, visit us at Herb Chambers Nissan of Westborough. Our knowledgeable staff can advise you on the parts you can add or can schedule a time for you to bring your car to the dealership to have it modified.